Themes in Windows have not changed all that much since the release of Microsoft's Windows 7 operating system. All versions of Windows ship with a selection of themes that you can switch between. Microsoft divides themes up into regular themes and high contrast themes, but that is about it. Each theme may change the desktop background, color scheme, sounds and screen saver. If you want more customization, you need to patch system files first to install full themes afterwards. These full themes may change other interface elements, icons for instance. Windows 10 does not ship with a "real" dark theme. The closest to that is the high contrast black theme the operating system ships with, but the color scheme it uses is rather weird and probably not to the liking of most Windows users who want a dark theme. Dark High Contrast Theme is a new theme for Windows 10 that changes that. The theme can be installed without patching system files. It is also a high contrast theme, but one that is optimized specifically to paint most of the interface in black or dark colors. 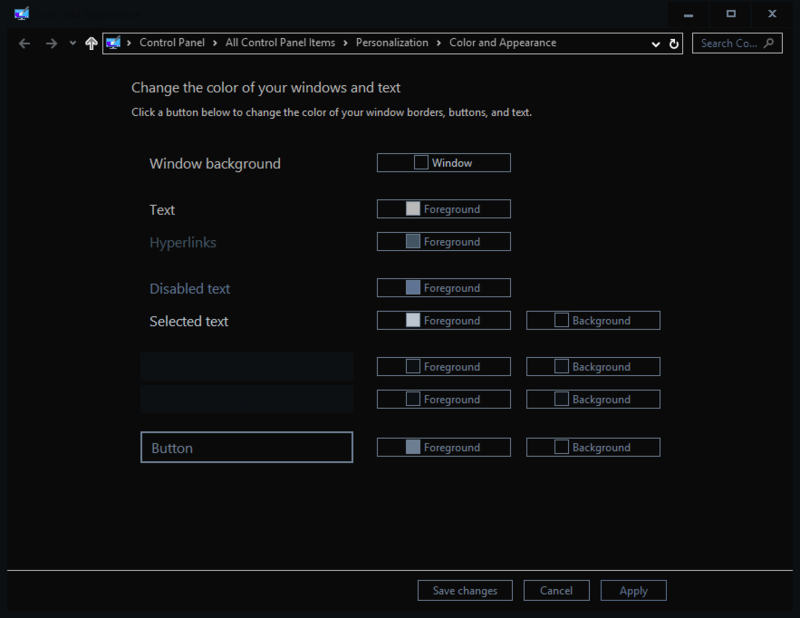 If you want, it is a modified copy of Windows 10's own high contrast black theme. Its main achievement is that it takes away the weird colors and replaces them for the most part with better fitting ones. You may customize the color scheme by loading C:\Windows\System32\rundll32.exe%20shell32.dll,Control_RunDLL%20desk.cpl,Advanced,@@Advanced in Windows Explorer. One thing that you may want to do is change "selected text" colors as black on black is used by default. This means that you cannot distinguish between regular and selected text by default after enabling the Dark High Contrast Theme on your PC. Simply change the "selected text" colors to modify that. You may also change colors used to display the window background, text, hyperlinks, disabled text, active window title, or buttons. The theme displays the majority of Windows menus and applications fine. You may run into some display issues in third-party applications though. The color scheme in Firefox for instance may not be to your liking, but you may use controls provided by the browser to change that. Load about:preferences#content in the browser and click on the colors button to modify hypertext colors and others. This is not an option for all apps or programs though. 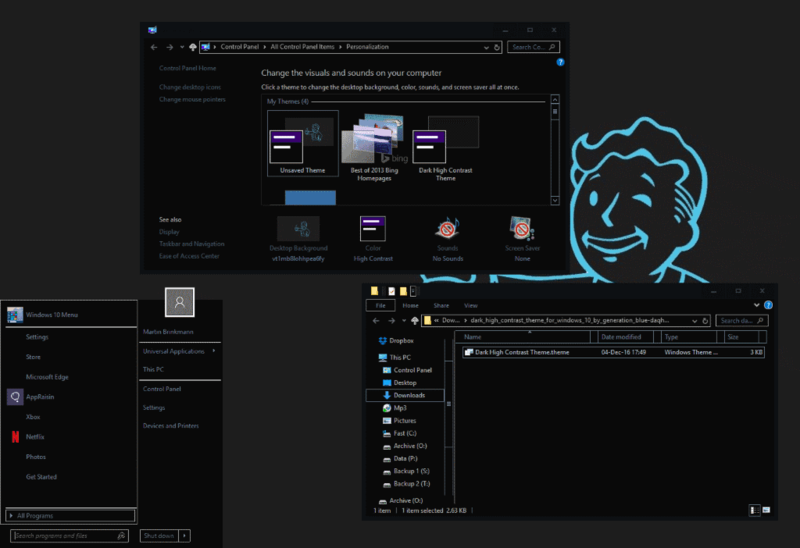 Dark high Contrast Theme adds more dark to Windows 10 than any other theme that does not require modification of system files. If you like your operating system dark, this is a theme you may want to check out. Since it takes a click to enable and undo any changes as well, there is little that can go wrong if you give it a try. Whatever happened to LiteStep… and DarkStep? Do people still use shell replacements? Kind of offtopic, but do the controls in Control Panel > Personalization: Desktop Background, Color, Sounds, Screen Saver; work or just point at the Settings application? Some open the Settings application, other classic Control Panel applets (desktop background and color open the Settings app, sounds and screensaver classic configuration menus). Thanks. I only have 1507 in a VM which lacks that. If you want to access the soon-to-be-removed Control Panel personalization applets, use the following commands from the Run dialog. If I recall correctly, control.exe is nothing more than a stub that simply redirects the calls to File Explorer so that the latter is directly run in the special Control Panel shell folder. Actually, high-contrast themes were revised in Windows 8. UWP on Windows 10 supports them as well. Good idea, thanks for the tip. I used to use uxtheme and various patchers in Windows 7 to be able to install themes. Looking at deviantart, there are already dozens of themes for Win 10 but I stopped trying to patch my system after I couldn’t login and experienced various problems regarding file system protection. UXTheme Patcher and its variants are old and not really good ways of achieving the goal. The now open-source UxStyle is a better solution. I haven’t tested UxStyle on Windows 10 nor does the developer claim compatibility but give it a try.